Let’s face it, Spider-Man has had his cinematic ups and downs. Reaching peaks with Spider-Man 2 and Spiderman: Homecoming, only to crash down with Spider-Man 3, The Amazing Spider-Man 2 and this year’s spin-off/unintentional romantic-comedy Venom. However, the latest film by a team featuring The Lego Movie co-screenwriter Phil Lord and Rise of the Guardians director Pete Ramsey is bringing a new vision of the superhero, which recently won the Best Animated Film at the New York Film Critics Circle. 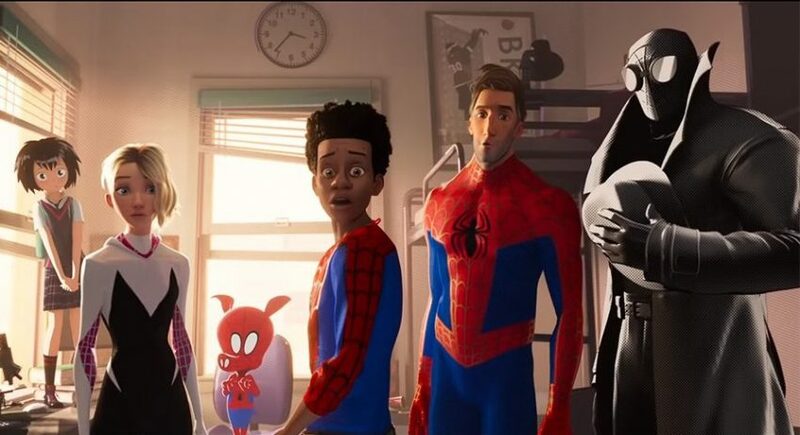 Spider-Man: Into the Spider-Verse stars Shameik Moore as Miles Morales, a Puerto Rican-African American high school student who gets bitten by a radioactive spider. Realising that he has similar abilities to Spider-Man, he is quickly introduced to the ‘Spider-verse’ where there is more than one web-slinger in existence. Before audiences dismiss this as another superhero flick, Into the Spider-verse is more than your normal origin film. It is hard to imagine a new twist on Spider-Man after decades of films, comics and television shows, but the screenwriters have designed a story for modern audiences who may not know the significance of Miles Morales in the Spider-verse. With him driving the film, the screenwriters boldly defy certain conventions in the majority of recent superhero films. In this case, there is a non-white hero, a female villain and (fortunately), no corny lines, so the narrative and dialogue (ironically) manage to keep the film’s character development grounded amid its fantastical elements. With The Lego Movie‘s Lord and Miller among the screenwriters, it’s no surprise that the script is full of wit and comedy, not to mention a throwback to the classic Looney Tunes cartoons for adult audiences. The team also takes care not to lose the key selling point of the film – the heroes themselves. Despite their individual quirks, the Spider-Men comprise of multiple different interpretations of the same superhero. As a result, there is no superiority over each other and essentially share a common understanding of being Spider-Man, making them a surprisingly level-headed team. Voiced by Moore, Miles is a compelling, relatable hero. Streetwise and highly creative his inner struggle with his abilities – and ultimately becoming Spider-Man – reflect his loneliness in the world, and is calling out for someone he can relate to. Filling in this role is his depressed and unconventional mentor Peter B. Parker (Jake Johnson) and Gwen Stacy (Hailee Steinfeld), who brings sass to the group. The supporting cast members, which includes Nicolas Cage, Liev Schreiber and Kathryn Hahn, are also having a ball in their respective performances. In terms of style, Into The Spider-Verse is unlike anything audiences will see this year. Directed by Bob Persichetti, Peter Ramsey and Rodney Rothman, it blends comic-style visuals with computer animation to create a frenetic and unconventional style that surpasses any other animated film this year. Combined with the fast-paced action sequences and an energetic soundtrack, the film is a heady cocktail of entertainment. It is hard not to get hyped up about Spider-Man: Into the Universe. But believe every word – every moment is worth watching. Spider-Man: Into the Universe is out in UK cinemas on 12 December. Best Spidey too, would you say? It’s a tough call between this and Spiderman 2 but I think this has a slight edge.